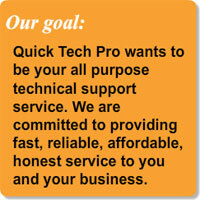 Quick Tech Pro computer and network service excels at reducing computer down-time and support costs, while increasing efficiency, communication, productivity, and employee job satisfaction. Call today or submit your information below to request information from a Support Advisor. The information you submitted will not be given or sold to third parties for any reason without your expressed consent. What computer support are you looking for?